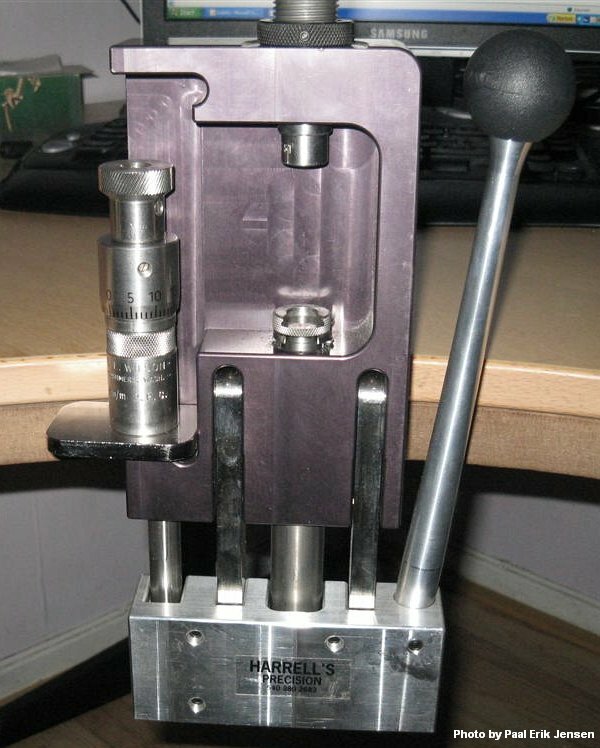 The Harrell's Combo Press gets its name from the fact that it combines both arbor and threaded die presses into a single unit, with a common operating handle and linkage. It was designed to save space in a range reloading kit, without sacrificing ease of use, and is suitable for any reloading chore that its 2.5" ram stroke can accommodate, allowing users to size cases up to 30-06 length (with a little attention to the decapping pin). I assembled the clamp to the press, pulled the top right hand drawer out of my desk, and clamped the press to its top. I just wanted to check out the ease of full-length sizing, so I grabbed a couple of odd fired cases from a desk drawer. Then I rummaged around for a FL 6PPC die, which, through no fault of its own had been relegated to paperweight status. I found the die, and then began looking for the matching shell holder. This forced me to do what I had been hoping to avoid, open up my range reloading kit, from which I removed some recently fired brass and the dies that I currently use, (a neck/bump die, and a base sizer), as well as my Nielson seater, and a shell holder, (removed from my Harrell's turret press). At that point the plan changed to "might as well do the whole thing". Getting down to business, I skipped lubing, since I have been able to get by without lube when using these particular dies, and I wanted an apples for apples comparison between the Harrell press and my regular RCBS Rock-Chucker bench press. After two-stage sizing the well-used (work-hardened) cases, I was pleasantly surprised. This relatively compact, lightweight "range press" has an unexpected abundance of leverage, and it doesn't wiggle around as you use it. 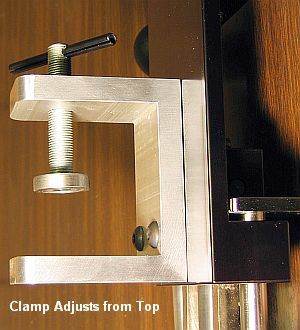 I attribute the lack of wiggle to the Harrell's substantial clamp, built of heavy-duty aluminum, with a beefy half-inch threaded clamping screw. The clamp opens to just over 2 5/8" (top to bottom). The clamp itself starts as a 4"x2" piece of half-inch thick aluminum box section. One side of the "box" is milled off, leaving a "C" of very rigid metal with plenty of horizontal "reach" to clamp securely to any bench-top. After using the press, I wanted to understand how the design and geometry functioned so well. I sat back, studied the press for a while, and then smiled, thinking, "I know how he did it." 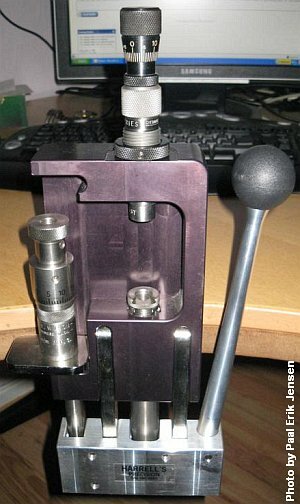 Here are the key design features that make the press work so well: 1) the large ball on the end of the handle makes it easier to grip; 2) the handle diameter is thicker at the bottom for strength and security of attachment, but tapers at the top (below the ball) for comfort; 3) the handle shaft is made as long as comfortable operation will allow; 4) the handle throw is 180°; 5) the ram stroke is a short 2.5", just enough for its intended range of use; 6) the press employs a compound linkage (for smooth power) similar to the one that RCBS pioneered. The designer of the Combo Press certainly did his homework--it's slick! In the upper picture, I put a case in the shell holder (under a screw-in die) AND placed my Nielson seater "hand die" on the seating platform. 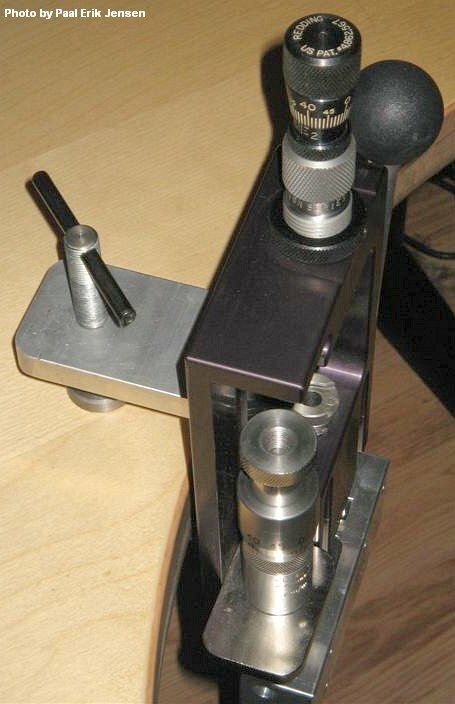 Normally, one would not use both arbor press-style dies and threaded dies simultaneously. But I placed both in the picture to make the dual capability of the press more obvious. The handle is shown slightly forward of its vertical, at-rest, position, with the ram and seating platform slightly elevated from their base points. It was at that point at a little light come on, and I realized that, given the range of calibers that I now load, this press was about to replace my Rock-Chucker as my primary at-home press. Oh I'll never sell my Rock-Chucker. It's a really fine press; it's just that it takes longer to set up, because I don't have a dedicated loading bench to bolt it to. I do most of my reloading at the range. The only exception is when I expand the necks of .220 Russian cases to make 6 PPCs, or load a few rounds for my Swift or .222, for an assault against the local ground squirrel population. Having sized the cases and checked them for runout (no surprises), it was now time to seat primers, and throw some powder. So I went back to the range kit for the Sinclair priming tool, Harrell Premium powder measure, and a bottle of Vihtavuori N133. The Harrell measure came from a time, a few years ago, when I wrote a review of it for Shooter's News. I think that I was the first to write an article about its roller bearings and other features. I wouldn't be without it. In addition to the tight drum to body clearance and superior smoothness afforded by the bearings, I have come to appreciate the ball and spring detent system that gives around .1 gr. of 133 per increment. With primed, powdered cases in the loading block, it was time to seat bullets, and put the only part of the press that was "different" to the test. For this, I set up with an open box of bullets (Watson 62s) on the left, loading block in front of me, and the press to my right. Starting out with the seater on the desk to the left of the press, I picked up a bullet between the thumb and finger of my left hand, set it within the chamfer of a case neck and slid my grip down just far enough to pick up the case along with the bullet. Picking up the seater with my right hand, I transferred the bullet and case to the seating platform, and while holding the bullet in position, slid the seater down over it and the case until it rested on the platform. 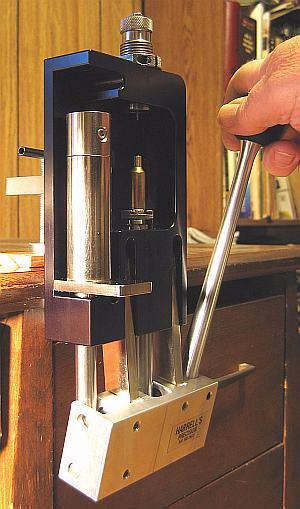 After sliding the die to the rear of the platform, a measured pull of the press handle bottomed the stem cap on the die body. I then reversed the press handle, slid the die forward, and picked it up, moved it back to its previous position on the desk, and removed the finished round from the platform, placing it into the loading block. Despite my initial misgivings, the whole operation had been virtually the same as with an arbor press, with no awkward retraining involved, going smoothly from the very beginning. Clamping the combo press to a shelf in your work area is the easiest way to store/display this press at home or in the shop. I say display because it has a distinctly ornamental quality that many well-made, shiny, machined things have in common. For you Kennedy machinist's tool box lovers, with the clamp off and packed beside it, the press will fit into a 13 ¾ x 6 x 2 inch space, which, according to my research, means that it will fit into the bottom drawer of the models typically chosen for range use with room to spare. So there you have it, 6 lb. 5 ounces of well-designed, expertly machined press that works well for $275.00. Having good tools just feels good, doesn't it? Sure, there are less expensive ways to skin this particular feline, but for those of us who are always looking for a way to reduce the size and complexity of our range kits, without sacrificing function, this press is an excellent choice which will also do a good job, at home, for any precision reloader who wants to use arbor press-type dies as well as their threaded brethren without the equipment taking up too much space between loading sessions. Copyright © 2005, Boyd Allen and AccurateShooter.com, All Rights Reserved.